I've used up the last of my flower shop stash so will have to stamp and fussy cut some more! The challenge at Cuttlebug Mania is embossing and to use a manual machine. This folder is flourish by Kaisercraft. It leaves a deep impression and only just seemed to fit through my cuttlebug with the normal embossing sandwich. I've used a couple of distress inks to highlight the details. At AAA Cards it's anything goes CAS. MFT tag stax die; Elizabeth Craft Designs curvy leaf die; Kaisercraft flourish embossing folder; Stampin Up flower shop stamp; vellum; versamark ink, clear & gold pearl ep; sentiment sticker. This is so beautiful, Cathy! Love the embossed flourishes on your tag! Another striking and fabulous card Cathy. This is lovely! Like the one below too. Great embossed flourishes and real nice highlighting on the background. Lovely card, Cathy. I really like that embossed tag. Thanks for playing along at AAA Cards. ahhh gorgeous work Cathy.. had a scroll down ads been a bad blogger not enough hours in a day, am sure they are getting shorter!!! I love your tag below as well as cards .. rarely do tags but they do look great! Gorgeous tag card. Love the inking on top of the embossing. Lovely texture. 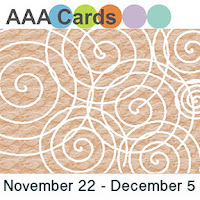 Thanks for linking up and playing along with us at AAA Cards.